Go Camping? Are we mad? 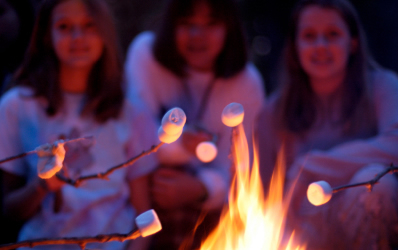 Go Camping With Kids – A Holiday that doesn’t break the bank! Tents are waterproof nowadays, and what’s more, they’re easier to put up. In fact if you’re a real novice you can even get tents that put up themselves (pop ups) or tents you can inflate. Facilities are warm with hot showers, real showers and often a shop on site. No more shivering above a bucket. Campsites are geared at families, with adventure playgrounds, the odd swimming pool and lots and lots of space to run wild – so very “Enid Blyton” . What’s more, there’s so much fresh air and fun, the Nintendos and other gadgets are often forgotten and instead you’ll find the kids climbing trees, or playing in meadows with their friends. Refreshing in this day and age. What’s more, camping is cheap. A holiday for the family for around £40 – little more than takeaway pizzas and a round of drinks for all. There’s little that can beat sleeping under the stars, and waking to the sun streaming into your tent. Or barbecuing outdoors with new friends whilst the sun sets. We’ve been running camping events for the last 6 years now at Single With Kids and have converted many a reluctant camper and complete novice. There’s no problem arriving on a site with no knowledge of how to put your tent up when you’re with a group of 30 families – there’s always someone ready to put the kettle on and lend a hand. Or if you don’t have all the equipment, do pop over to our forum where you’ll find a wealth of information on what to bring camping, and even someone who may be able to lend you some of the basics for your first trip. What are you waiting for? There’s never been a better time to go camping UK style. ← Single Parent Holidays – Think Safety! Camping with kids can be a challenge, but it needn’t be! We’ve complied all sorts of handy information from our seasoned happy campers to help make your next trip a delight.